Elegant desk system features an adjustable design that also swivels to provide an optimum, ergonomic viewing angle. Letter-size sleeves feature rugged frames and open on two sides for easy paper insertion. Plus, the sleeves and frames are made of a glare-free, environmentally friendly polypropylene for better viewing. 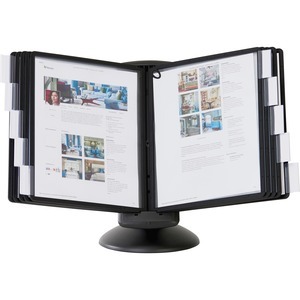 Paper Secure corner clips hold the pages safely in place and add a stylish design accent.